Here’s another version of Burda 103-07-2010. They’re made from the same silver-painted stretch denim as last time, but this piece of fabric wasn’t pre-washed so is still very shiny. It won’t last of course but I will enjoy them before they fade. The last pair had loads of wrinkles under the bum. I tried taking the crotch seam in a bit on the new ones and it’s slightly improved, but I think The Sewing Miserablist is right and there’s something else going on as well…maybe the back is too wide because I can certainly pinch out a vertical dart there. Another thing I did differently with this pair was pressing some of the seams the opposite way to the Burda directions. Here’s the technical drawing, which we’ll probably need in order for this to make sense. The style has the side seams moved forward to accommodate an extra panel down the side and back of the leg. Burda has you press both the seams on that panel towards the back. For this pair I pressed both the seams onto the side panel (ie the back seam was pressed towards the front of the trousers) which gives the extra panel more emphasis, especially when topstitched. The front’s come out pretty well. Like last time I deliberately made the legs very long, so all the wrinkling at the knees and below is because of that. 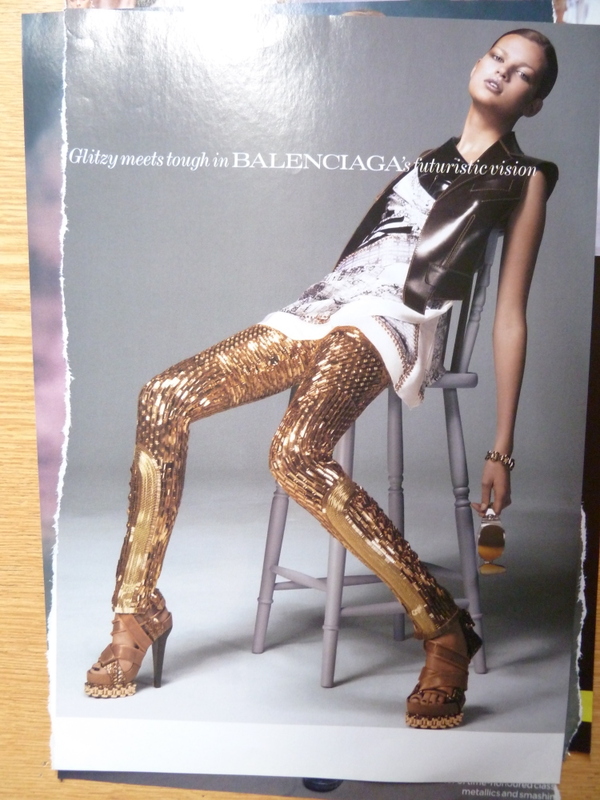 And just for fun, here’s me failing to replicate one of my large collection of shiny trouser inspiration pictures. Me. I forgot she had those sunnies, I was wondering what to do with my left hand. Anyway that’s probably it for trouser-making for a little while. I have a couple of cycle-friendly dresses planned next. Posted on September 22, 2013 April 14, 2016 by catherinedaze	This entry was posted in burda, Finished, sewing, trousers and tagged burda, dressmaking, sewing, silver, trousers. Bookmark the permalink. You look like a ninja in that first pic 🙂 A ninja with shiny pants. Very cool! Fantastic pants and I like the fit. In my dreams I could wear something like that! Great trousers! Getting the fit right on jeans is a frustrating science, but I know you’ll figure it out! I’m trying to get my first pair of jeans made with decent fit, and it’s challenging, to say the least! I’m really liking the design of these. All the seam details make for an interesting pair of skinnies. Nice hair and great pants! Hawt! Definitely, totally hawt!! I don’t think the wrinkles look bad–they look intentional! Nice silver space girl trousers!! And great poses! Seriously you’ve such a way with sewing up great trousers/ jeans…hey look a great fit to me too. Love these, you look so cool! These are the kind of jeans I would wear if my legs didn’t look like a couple of very short badly stuffed sausages. Ultra cool! I really like the slouchiness around the legs a lot. I always have to pinch a good few inches out of the small of the back too, which is why I sew the waistband on in two halves *before* finishing the remaining half of the crotch to centre back seam. That’s where I do all the final fitting. These are uber cool… but that’s basically what I always anticipate seeing when I drop by here! Am absolutely loving these pants. Oh my, these are awesome! I am 100% certain I couldn’t get away with a silver version but thanks for highlighting the pattern, it looks like a great one for pants, lots of seams to make adjustments on. Enjoy the sparkle while you can! I traced them out and never made them, and now you have me salivating! Ooooooohhhhhh, I really like the second pair. The first pair is kewl but the shiny ones re awesome! Ooooo I love your skinnies. I am dead impressed and very sorry to hear about your sewing machine disaster …..
Do you have to wash them? I mean ….